Pushing Pakistan to act against India-directed terrorism, Prime Minister Manmohan Singh on Thursday told Pakistani President Asif Ali Zardari that expeditious conclusion of the Mumbai terror attack trial in that country will be a “major” Confidence Building Measure in bilateral relations. During a meeting between the two leaders which lasted more than half-an-hour, Dr Singh underlined India’s terrorism-related concerns. The Prime Minister “underlined our terrorism-related concerns. He pressed for an expeditious conclusion of the 26/11 trial and said that action taken in this sphere (terrorism) would be a major CBM,” foreign secretary Ranjan Mathai said, briefing reporters on the Singh-Zardari meeting on the sidelines of the 16th NAM summit here. 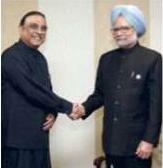 Dr Singh was accompanied by external affairs minister S.M. Krishna and other senior officials while Mr Zardari had his son Bilawal Bhutto, foreign affairs minister Hina Rabbani Khar and interior minister Rehman Malik in his team.